AT&T is down 20% over the year and 5% this week on weak fourth quarter wireless adds and a revenue miss of $510 million, although up 15.2% year-over-year. The stock has bounced back a bit. I say the selloff on earnings was unjust. You best buckle your chin strap and buy the dip before it's gone. In the following piece, I make the bull case. AT&T (T) shares took a nosedive after reporting fourth quarter results that met adjusted EPS estimates, beat on GAAP EPS, yet missed on revenue. "I would characterize our results as basically doing exactly what we committed during our Analyst Day in November and in fact I would say we're ahead of schedule on each of our key priorities, and as we said our top priority for 2019 is driving down the debt from the Time Warner acquisition, and I couldn't be more pleased that how we close the year. We generated record free cash flow of $7.9 billion in the fourth quarter with the dividend payout as a percent of free cash flow below 50%. Our full-year free cash flow was also an all-time record even with near record capital spending. For the full year, our dividend payout as a percent of free cash flow was 60% and that allowed us to increase the dividend in December for the 35th consecutive year." I feel those who sold missed the forest through the trees, so to speak. AT&T is just getting started. Below are my positive takeaways from the earnings report. Did you catch that first bullet point? They had $22 billion in FCF last year and expect $26 billion for 2019. I like that year-over-year gain. The payout ratio is great at 50%. The amazing thing is that's 50% of a substantial sum of money, leaving you with $12 billion or so to put to work or pay down debt. AT&T is laser-focused on paying down debt. AT&T has a lot of debt as many quite often state. Therefore, the company needs substantial cash flows to meet debt obligations while simultaneously achieving business growth goals. 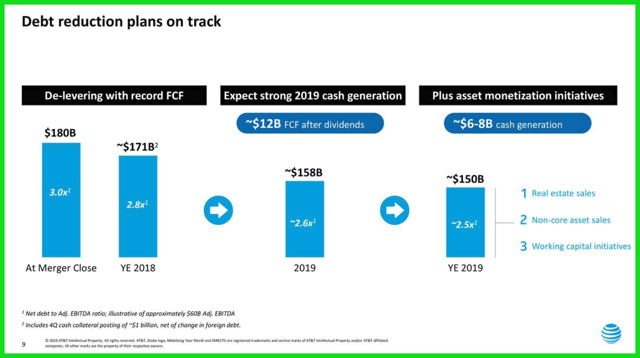 AT&T's free cash flow is a record $22.4 billion in 2018, that's up 36% with $7.9 billion of that coming in the fourth quarter. AT&T always had prided itself on having the ability to pay a hefty dividend. Strong free cash flow generation has allowed the company to pay a solid dividend since 1983. AT&T has consistently raised the dividend for the past 35 years. 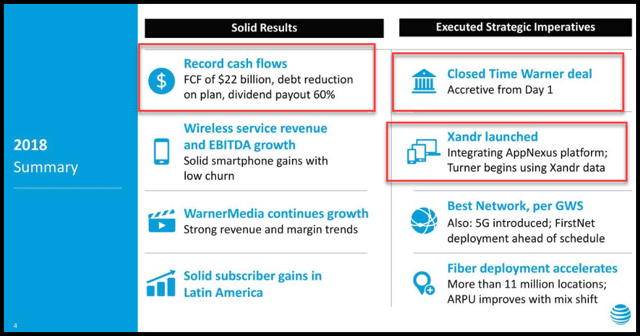 Generating strong excess free cash flow is critical to AT&T achieving its commitment to improve the leverage ratio to less than three times. This is critical for Moody's. It looks like the plan is on track. "You know our leverage commitments we made, our goal was to get to the 2.9 range by the end of ‘18. Well we did that by paying down about $9 billion since we closed the Time Warner deal. Our next goal is to drop that even lower to the 2.5 range by the end of this year. Our strong free cash flow in 2018 gives us confidence we'll achieve our 2019 free cash flows and be able to significantly delever. 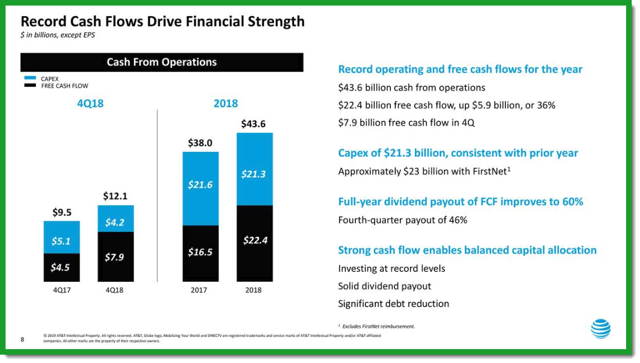 We expect about $12 billion in free cash flow after dividends in ‘19. We've committed to use that to pay down debt. That alone will get us to the 2.6 range by the end of the year." The company is producing plenty of cash and is putting it to proper use by paying down debt to achieve leverage targets, continuing to invest in growth businesses, and returning well-covered substantial yielding dividend to shareholders. On top of this there's still about $2.5 billion in synergies to realize over the next few years. So the company is flush with cash and we haven't even realized much of the synergistic upside as of yet. They remain on target at $1.5 billion in cost and $1 billion in revenue for a $2.5 billion run rate by the end of 2021. The company also is finding ways to monetize its duplicated physical assets with some significant sales. The company has made several asset sales moves, most recently closing a $1.1 billion sale of some data centers. The company states they have identified billions of dollars of other monetize-able assets as well. "We have a large amount of office buildings and raw land that we've identified for potential sale. Our Hulu investment is another opportunity with more than $500 billion in total assets we'll continue to look for ways to monetize our asset portfolio and keep you updated on our progress." 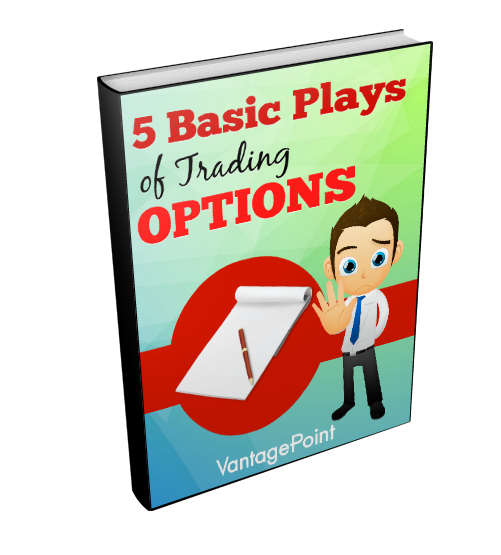 This all adds up to a very safe and predictable income stream with the opportunity for growth. I have been behind the AT&T/Time Warner merger from the start simply because it looked like the right thing to do from an operations perspective. If AT&T is going to pay billions of dollars to build out the network so everyone, everywhere, on any device can access and consume content, the company might as well own it and reap the lion's share of the profits. I say this opportunity will go a long way to decreasing the debt load that so many have espoused will be the end of AT&T's dividend. Furthermore, the stock is trading at a rock-bottom valuation, paying a substantial 6.80% dividend yield, has a 50% payout ratio, and is growing cash flow by nearly 20% year-over-year. 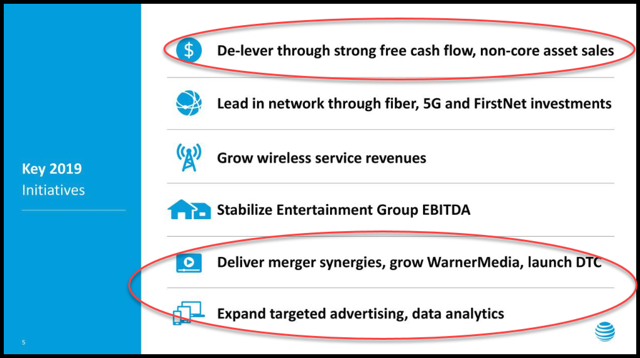 I say many people are vastly underestimating AT&T’s prospects for growth when fully integrating WarnerMedia. I believe the two combined will be highly synergistic and continue to provide a boost to the bottom line. The fact is AT&T's growth prospects have increased substantially. It's always darkest before dawn. Buckle up your chin strap and buy into the weakness. AT&T is on sale.